Property 5: Welcome to the town center of Toledo. Enjoy its history. 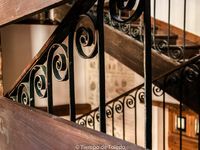 Property 14: IMPECCABLE AND COMFORTABLE APARTMENT IN THE OLD TOWN. ACCESSIBLE BY CAR WIFI!! "The Balcony of the Tagus". Historic helmet. Garage. Wifi!! Property 16: "The Balcony of the Tagus". Historic helmet. Garage. Wifi!! comfortable family home in Toledo with pool and free parking. Property 22: comfortable family home in Toledo with pool and free parking. 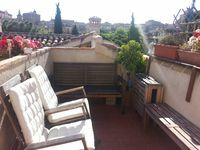 Apartment between Alcazar and Cathedral, parking included. Property 31: Apartment between Alcazar and Cathedral, parking included. SCOTLAND: Luxurious, cozy and intimate . : Cuesta Pajaritos Entry No. 1. Property 49: SCOTLAND: Luxurious, cozy and intimate . : Cuesta Pajaritos Entry No. 1.
the location is very good for touring Toledo. The house was very clean and neat. The host was very prompt and offered good advice on where to eat and what to see in the city. If you are traveling by public transportation this would be a great location for seeing the city. The only issues we had were that parking even though was said to be free was very difficult to locate and a nice walk up a very steep hill to get back to the home. We ended up parking in the parking garage located close to this house and this added an extra 40 Euro to our two-night stay. Also, there was only one towel per person for a two-night stay. I know probably not a big deal for most folks, but we bought ourselves an extra towel for the extra night not to use the same one twice. We loved this apartment! Especially the terrace for a sunset view over the city. Danny is a great host and provided plenty of information to orient us to the city when we arrived. He was also responsive when we needed a couple essentials. The kitchen has the essentials for coffee and tea. We didn&rsquo;t cook but it appears to have the basics if you want to cook. We would definitely stay here again.